1 Department of Dermatology, Kasturba Medical College, Manipal University, Manipal, India. 2 Department of Pathology, Kasturba Medical College, Manipal University, Manipal, India. Rhinosporidiosis is a fungal infection that commonly involves the nasopharynx. Involvement of the skin is uncommon. We report a case of disseminated cutaneous rhinosporidiosis in a 56 year old male who presented with multiple erythematous nodules and verrucous lesions over the malar areas, nose, and forehead along with nasal obstruction and dysphagia. He gave a past history of receiving treatment for nasal rhinosporidiosis. We report this rare case of disseminated rhinosporidiosis with cutaneous involvement. Rhinosporidiosis is a chronic granulomatous infection caused by Rhinosporidium seeberi . It is endemic in developing countries like India and in Sri Lanka  Infection is acquired by contact with contaminated fresh water such as in swimming pools. Rhinosporidiosis most often involves the nasopharynx presenting as painless, friable, polyps however, cutaneous involvement is quite rare. We report a rare case of disseminated cutaneous rhinosporidiosis associated with nasal, conjunctival and pharyngeal lesions. 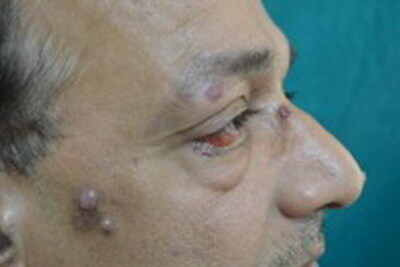 A 56-year- old man presented with multiple cutaneous lesions over the face since 3 months. He also complained of nasal obstruction and dysphagia since one month. On examination, there were multiple erythematous nodules and verrucous lesions over the malar areas, infra-orbital region, temple, and forehead. Also seen was a small polypoidal lesion on the palpebral conjunctiva in the right eye. (Fig 1). The patient gave a history of being diagnosed with nasal rhinosporidiosis 1 year ago, for which he had received treatment with Dapsone 100 mg once a day for 6 months without improvement. Nasal speculum examination revealed few friable polypoidal masses in bilateral nasal cavity while oral examination revealed a polypoidal mass in the posterior pharyngeal wall. Nasal, conjunctival and pharyngeal rhinosporidiosis with cutaneous involvement was considered in the clinical diagnosis and a biopsy of skin lesion was taken. 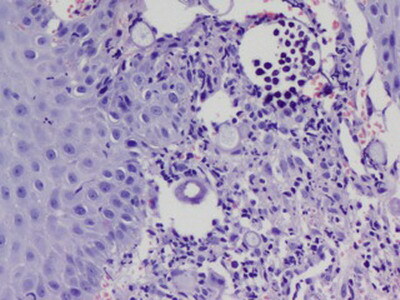 Skin biopsy showed hyperplasic epithelium, overlying numerous sporangia in varying stages of development with thick wall, containing numerous endospores. There was dense infiltration by acute and chronic inflammatory cells with eosinophils and granulomatous response around endospores from ruptured sporangia. (Fig 2). Final diagnosis of disseminated rhinosporidiosis with cutaneous involvement was made. Cutaneous lesions were treated with liquid nitrogen cryotherapy and dapsone treatment was continued. The patient is due for follow-up. Rhinosporiodosis is a chronic granulomatous disease, that has been known to mankind for over a hundred years, since its first description in Argentina. The presumed mode of infection from the natural aquatic habitat of R.seeberi, is through the traumatised epithelium ('transepithelial infection') most commonly in nasal sites. The infection most commonly affects the upper respiratory sites, notably the anterior nares, the nasal cavity - the inferior turbinates, septum and floor resulting in slowly growing masses with pink to purple, friable polyps studded with minute white dots (strawberry like), which are sporangia containing the spores. Posteriorly, rhinosporidial polyps occur in the nasopharynx, larynx, and soft palate; the buccal cavity is only rarely affected. The disease, while being of special interest to oto-rhinolaryngologists, is of interest to dermatologists and ophthalmologists as well, as can present with granulomatous lesions in the skin, subcutaneous tissues and eye. Rhinosporidiosis can occur in four forms; nasal, ocular, cutaneous and disseminated (rare). Infection of the nose and nasopharynx is the most common accounting for more than 75% of cases, while infection of the palpebral conjunctiva or associated structures like the lacrimal apparatus is seen in 15% of cases. The disease frequently recurs after surgery, with occasional dissemination from the initial focus which is most commonly seen in upper respiratory sites. Cutaneous lesions are uncommon and are generally associated with mucosal lesions. they usually begin as friable papillomas that become pedunculated. It may also present as warty papules and nodules with whitish spots, crusting, and bleeding on the surface. Cutaneous rhinosporidiosis may occur due to several modes: autoinoculation, hematogenous spread, direct inoculation and lymphatic spread resulting in disseminated cutaneous lesions. In our case, the patient had a nasal, pharyngeal and conjunctival lesion with disseminated cutaneous lesions. Thorough work-up to rule out systemic involvement is needed as cutaneous lesion may be an indication of early dissemination. Involvement of lungs due to visceral dissemination has been reported but is very uncommon. No features suggestive of systemic lesions were seen in our patient on further evaluation. Histopathological examination reveals numerous globular thick-walled cysts (sporangia), up to 0.5 mm in diameter, which contain numerous rounded endospores, 6-7 µ in diameter. Immature and collapsed sporangia are also present. No special stains are usually required because of the size of the agent. This disease must be differentiated from coccidiodomycosis which however has different clinical presentation and smaller sporangia size. Surgical removal and diathermy excision are the treatment of choice, however recurrence is common. Drugs to treat rhinosporidiosis include dapsone, ketoconazole, ciprofloxacin and amphotericin B, but dapsone is found to be most effective. Dapsone may arrest the maturation of sporangia and accelerate degenerative changes in them. The effete organisms are then removed by an accelerated granulomatous response. The current case highlights the rare occurrence of disseminated cutaneous rhinosporidiosis, possibility of which should be thought of when cutaneous lesions are associated with nasal or pharyngeal lesions. 2. Thappa DM, Venkatesan S, Sirka CS, Jaisankar TJ, Gopalkrishnan, Ratnakar C. Disseminated cutaneous rhinosporidiosis. J Dermatol 1998;25:527-32. 3. Prasad K, Veena S, Permi HS, Teerthanath S, Shetty PK, Shetty JP Disseminated Cutaneous Rhinosporidiosis. J Lab Physicians. 2010; 2(1): 44-46. 5. Lupi O, Tyring SK McGinnis MR. Tropical dermatology: Fungal tropical diseases. J Am Acad Dermatol 2005;53:931-51. 6. Ali A, Flieder D, Guiter G, Hoda SA. Rhinosporidiosis: An unusual affliction. Arch Pathol Lab Med 2001;125:1392-3.